The production starts with a screening of Bruce Springsteen and band playing ‘Dancing in the Dark’ in front of a massive outdoor crowd. This video is projected onto a large circular screen (or drum) which is located at the back of the set. Once this plays out, Peter Coonan (Love/Hate) arrives on stage and explains that Bruce changes the world around you. When Peter gets into his Gremlin car and plays the music of Bruce, he is transformed from a loser to a character in an epic poem about losers! He becomes something great and noble. Peter is then joined on stage by his three other cohorts, in Maud Lee (Maud in Cahoots), Aoife Spratt and Stephen Quinn as they shuffle on stage. They are dressed in average clothing other than Stephen Quinn, who is wearing a black dress. This is a production by One Two One Two which was first staged in 2016. It is billed as a “live staging of a concept pop album”. This production company had one of the more successful productions in the Fringe Festival this year with ‘Everything I Do’ which sold out for most of its run. The return of this production should therefore come as no surprise. It focuses mainly on the music with some theatrical interludes between the songs. The setting is a kitchen table where all four of the band members sit. The songs are quite mundane in nature, taking on domestic topics and exploring their introspective nature. We hear songs about communion dresses, burning food, watching day time television and other everyday occurrences. The music is based around layered vocals for the most part. The vocals are often looped to build up a full sound from quite humble beginnings and they work well. Percussion sounds are sampled from the few small items they have on stage with them. There are a few songs with instruments on backing tracks and even an appearance of a guitar player in the wings for their final moments. There is crowd interaction, as we are asked to sing along with two tracks. The first being an evangelical song, as Peter Coonan tries to drive the crowd into a frenzy. The second is a simple track about getting someone off the sofa and out to meet friends. The piece explores the prosaic nature of our daily lives, the humdrum aspects of so much of our routines. Although quite different from Bruce Springsteen, who often conjures something epic from these ingredients, here they are displayed for what they are. 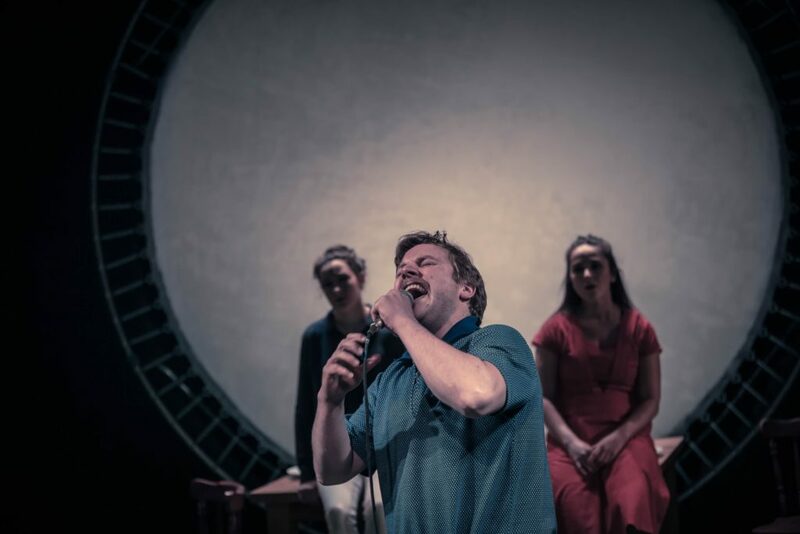 We do see some wild dancing at times, with Peter Coonan literally bouncing off the walls and Aoife Spratt throwing herself around the stage, but for the most part they remain controlled and remote, allowing the music to do the talking.